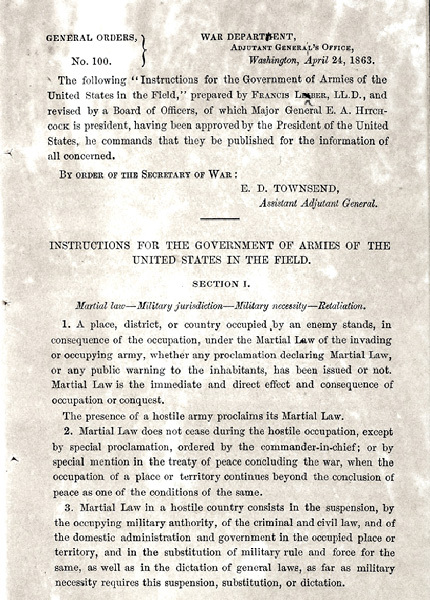 With so much attention being focused these days on the anniversaries of events during wars of America’s past — particularly the Civil War, The Legal Genealogist pauses once again to consider the laws of war. We’ve already looked at the codes governing the conduct of members of the military in the context of their military duties;1 today, let’s look at the laws of war itself — the laws governing how war could and should be conducted. By the 17th century, the Dutch jurist Hugo Grotius wrote at length about acceptable conduct during warfare in three volumes entitled De jure belli ac pacis libri tres (On the Law of War and Peace: Three books).4 Grotius’ work colored the attitudes of his day and drove the shift away from scorched earth policies to a more humane view of how the military should behave on the battlefield, to prisoners, and to noncombatants. 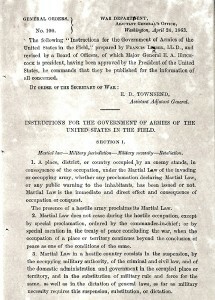 It was a revolutionary document, designed as a guide to rules of engagement — how to fight a war, as opposed to how to act like a soldier. It built on Grotius’ earlier work, and set the legal framework that persists to this day to govern behavior on the battlefield, towards prisoners of war, and towards enemy civilians and noncombatants. Its provisions were extensive — the code had 157 articles, broken down into 10 sections ranging from martial law to assassinations to treatment of spies. …as civilization has advanced during the last centuries, so has likewise steadily advanced, especially in war on land, the distinction between the private individual belonging to a hostile country and the hostile country itself, with its men in arms. The principle has been more and more acknowledged that the unarmed citizen is to be spared in person, property, and honor as much as the exigencies of war will admit. So as we spend the next weeks and months as genealogists, reading the records our ancestors left in their wars, let’s keep the legal framework governing their conduct in mind. It may very well explain why something was done the way it was done… or the consequences when it wasn’t done the way it should have been done. Thanks, Bill… and for those who haven’t encountered the Civil War Daily Gazette yet, it’s here and it is really a great resource.